Infrared Gas Camera is the only Infrared Camera specially designed for the Petrochemical, Gas & Oil market requirements for gas detection and Smart LDAR compliance. Simplifying and broadening opportunities for use inside the facility limits without the need of a hot work permit allowing video and audio recording while maintaining intrinsic safety. The Infrared Gas Camera allows the inspection of vast areas in a plant with an automated and simple user interface, visualizing the infrared image on a large color LCD. Build-In DVR (Digital Video Recording) allows video and audio recording for up to 6 continuous hours. Industry Specific Design – EyeCGas was designed specifically for the harsh environments of the Oil and Gas industry; the camera is extremely rugged, robust, and is sealed for severe outdoor industrial conditions. EyeCGas was certified to meet IEC standards for temperature, humidity, vibration, and dust and water intrusion. The Infrared Gas Camera is the only camera certified for use in Class I Div 2 hazardous environments. Enhanced image processing algorithms to enable the detection and localization of the smallest gas leaks. 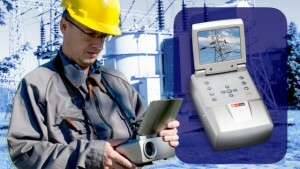 Real time video recording with audio narration for improved debriefing and off line analysis. Safety – Detect safety risks by providing a clear visual of methane and other volatile organic compound (VOC) emissions. Environment – Quickly and clearly detect invisible fugitive gas emissions that are harmful to the environment. Operational Efficiency – Scanning for multiple elements simultaneously reduces the cost for leak detection and minimizes product loss for improved ROI. Glare Shield – For use in bright light conditions and allowing both eyes observation with a magnification of almost X3, to find more efficiently the leaks. New Model UV camera detects partial discharge conditions and offers longer battery life with a larger display. The ability to “see” power being delivered over transmission or distribution lines — it takes video that detects and records potentially harmful coronas. High sensitivity to UV radiation over a spectral range of 240 to 280 nm. A built-in GPS to accurately locate and record corona-emitting sources. The ability to operate in full sunlight without degradation. A 5.7” color, LCD touchscreen with 26X optical and 12X digital zoom with dual image technology that can display both visible and UV images simultaneously. Audio input and the ability to upload recorded information via an SD card or video cable directly to a PC. PC software provided to facilitate creation of reports. We are the world leader in the design and manufacture of infrared core solutions for small unmanned systems. We supply more thermal imagers for unmanned platforms than any other company in the world. 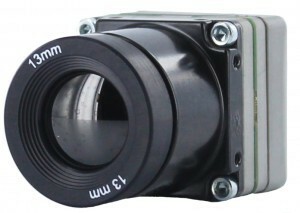 Our Uncooled Camera is the smallest and lightest fully-integrated uncooled camera in existence. It’s designed for infrared core applications that require minimum volume and weight, it is rated for extreme shock and operating temperature environments. Our several lens options are available. Key features include 17-micron VOx FPA pixels for superior image detail, 640 x 512 or 336 x 256 resolution options, ultra-small volume and mass, and an industry-leading shock rating. The debate over the use of UAV/UAS drones in America has been a hot topic for some time now with folks being concerned about privacy issues. (The Federal Aviation Administration has banned all commercial use of UAV drones, but now there is a directive in place to have a plan to legalize commercial drone use by 2015). Now, it seems as though more practical uses for drones may be taking them off the “no fly” list. The FAA recently relaxed it’s ban over unmanned aerial vehicles for agricultural use in New York, granting an exemption and allowing crop researchers to begin using infrared cameras for agriculture mounted on drones to begin monitoring the farmland remotely. Quality security systems are important for anyone wanting to protect their assets whether it be personal or business. We offer Commercial Security Corona Camera Systems, that will do just that. There are many different types of security systems for the home or business and we carry many of them. The most important thing is to find a system that is going to cover specific needs. Some handle just audio and video, others just video, there are some that are just burglar alarms, to alert to an intruder in the unwanted area. Security systems have come a long way from what they were as now there is also Computer and Mobile monitoring as well. Commercial Security Systems allow for safety of office equipment, supplies, staff and more. Keeping the office atmosphere safe and secure is very crucial to a business’s day to day actions in real time. Employees that feel safe and secure at work will show up to work more often, they will be less inclined to file false insurance claims, and an alarm system will help protect against loss from theft. Keeping a property safe and secure is important in order to provide protection not only for our belongings, goods, surroundings, as well as the people we love and work with. One way this can be done safely is by installing Security Corona Camera Systems in the home or office. Regardless of why our customer needs a security system it is vital that they receive one that will be tailored to their needs. Otherwise, thieves may be able to use blind spots to get in and remove valuable items from the property, and more.